On demand delivery service apps have taken the world by storm in today’s times. There was an age when people would have to pay regular or intermittent visits to stores or shops. It came in the face of coercion rather than a healthy choice back then but the situation has changed dramatically. 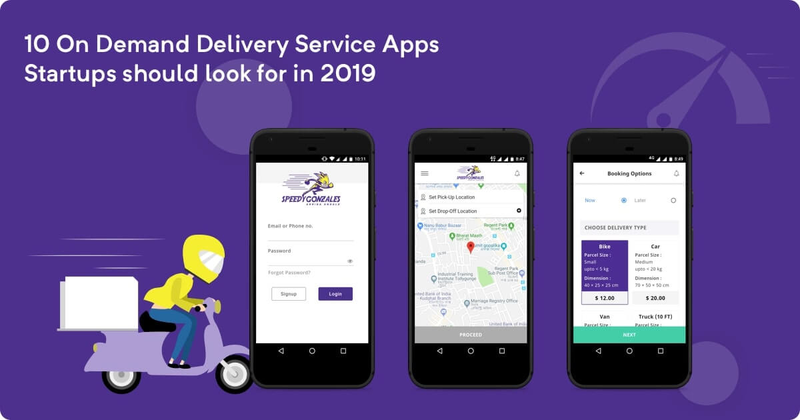 Over the last decade, we witnessed an exponential bloom of apps including these ‘On Demand Delivery Service’ ones as well. Now, you get goods delivered to your doorstep in a single click on your smartphone. Be it food, healthcare, travel, home services or anything remotely useful to us. Walking into shops has devolved into an antique practice with the oncoming On Demand delivery service app development started by entrepreneurs. They do not require to bide in a cloud of compulsion like before. To cut to the chase, these apps have indeed made our day-to-day life much easier. But Which Apps Have Made It To Their Success? Sundry brainchildren emerged during this tenure but only a handful could garner mass interest. Here’s a list of those successful ideas to create on demand delivery apps and reasons why budding startups should look up to them. Let’s talk about them in detail. While India was scouting for options to deal with the predominantly bothering mobility issues raging in its cities, online cab service apps showed up. It seemed there was finally an answer in sight that would address the missing part of the mobility puzzle by splicing convenience with cost. But still problems like long hours of waiting, opaque pricing, pollution and traffic couldn’t be addressed adequately. Rapido emerged in 2015 solving many of the problems which were lingering on even after the advent of online four-wheeler cab services. Along with making lives easy, startups are also about breaking cliches and Rapido has come out with flying colours in both these avenues. With readily available bikes and scooters, this app costs you nothing more than a fair price and a few taps on your smartphone. Headquartered in Bengaluru, it provides services in most of the major cities in India. Rapido is considered to be one of India’s largest bike taxi services presently. Designed for modern India, Rapido also makes it a point to include the factor of expediency in your daily commute. Why Rapido if you want to create on demand app? This app is to look out for because it embraces unconventional concepts to start with. As mentioned above, bike taxiing is one of the most feasible options of mobility in India given the pollution and traffic conditions here. So, startups should strive at finding solutions to thriving as well as imminent problems. They need to look for solutions in solutions as well like Rapido did. As per an article published on 18th Jan, 2019, Rapido has recorded two million app downloads on IOS and Android. It is also operational in 16 Indian cities from metros to small towns. It has 5000 daily and 10000 monthly drivers or ‘Captains’ as they are called including women. To ensure safety and hygiene, both Rapido Captains and pillion riders are given helmets, shower caps and even raincoats. Riders can ride between 6 am to midnight with a base of Rs. 15. Rapido also launched its special features for the visually challenged last October and around 80-100 such riders have been recorded to ride daily. So, what do you think of this on demand app development idea for bike taxi? Delivering goods from one place to the other has always been of prime importance for people around the globe. But the common populace was only acquainted with services from companies like FedEx and UPS earlier. You’d have to either call or walk down to their respective offices to get goods sent. How Roadie made it and how its functioning? Roadie redefined the character of delivery services with its launch in 2015. This Atlanta based Company delivers almost anything and everything across the country- no matter how big it might be! If you need something delivered, you can download the app and create yourself a delivery gig, which will match you up with a roadie driver headed your direction. And when the gig creator and Roadie accept, a common time is set and the package can be tracked as it is on its way to the destination. Why Roadie as an idea if you want to create an on demand app? Roadie makes it easier for enterprises to launch and scale same-day delivery to reach customers anytime, anywhere. With the nation’s most flexible and scalable delivery solution, they can get new markets up and running in weeks.Roadie has set a new benchmark in delivery services as now goods can be delivered in a single touch on your smartphone. Budding entrepreneurs looking for startup options could venture into this sphere of on demand delivery service app development with a keen eye as there aren’t many who have as of now. Roadie offers a single, uniform solution that reaches 89% of all U.S. households as per reports. With 120,000+ drivers across all 50 states, their flexible fleet of passenger cars, trucks and vans can meet variable demand. To add to it, Roadie has also delivered to over 11,000 cities and towns nationwide. Managing kids can get really stressful at times and you’ll decipher better if you have them. An easy life can get highly difficult if you have to juggle between work and looking after kids. But kids comprise the most sensitive part of one’s life. You cannot leave them alone at your residence when you’re woking. You’d need someone highly trustworthy and dependable to look after them and this is where Kango steps in. It seeks to bring some relief your way through its app, which lets parents find carpool rides for their kids, set up childcare services, make playdates or just request help from someone willing to offer. Why Kango as an on demand app development idea? All caregivers at Kango have had background checks and have been fingerprinted to ensure that your children are cared for by trusted professionals. This app also helps you get access to a map that shows where your children’s driver is in real-time with an option to talk to them directly. Kango has made it quite big among Childcare delivery apps since it’s inception in early 2016. “Be ready for anything: plan for scale and have the right team.” as Sara Schaer, the CEO of Kango has said is what every startup ideator needs. Kango currently serves in the San Francisco area and Los Angeles but has plans to expand as well. It has been declared as the ‘Best Uber for kids’ by San Francisco Magazine in 2018. It seems Kango can be a good example if you want to create on demand app. In times before the On Demand delivery service app development, food was also one of the services we had to avail by going to restaurants and street vendors. But with advent of apps like Grubhub in as early as 2004, this problem was solved as well. This app assisted you in ordering food from wherever you were, from eateries around you and is one of the largest on demand food delivery app in the world now. Grubhub helps you search for eatables by cuisine, restaurant name or menu item. It not only classifies according to only cuisines or restaurants but also provides you with options lie ‘gluten free food delivery’ and ‘healthy food delivery’. Grubhub enables you to place your order by phone or online and also gives you access to reviews, coupons, special deals and a 24⁄7 customer care service. With food being one of the earliest industries to be approached by the On Demand Delivery startups, this app paved a rather clear pathway for numerous likely apps to emerge. After Grubhub started functioning, many ideators got along with the grove and famous (today) food delivery apps like Zomato, Swiggy and Food Panda sneaked into the market. Ergo, Grubhub stands as an inspiration to many for those who want to create on demand app in food delivery sector. As of Q1 2018, Grubhub has a widespread list of 14.5 million active users and 80000 associated restaurants across 1700 cities in the United States. For the second quarter of 2018, the Company posted revenues of $240 million, which is a 51% year-over-year increase from $159 million in the second quarter of 2017. Gross Food Sales also grew 39% year-over-year to $1.2 billion, up from $880 million in the year ago period. Doing your own laundry and going out of your way to get to the dry cleaners’ can be a pain sometimes. Launched in 2013, Rinse helps you out with both. Rinse aims at simplifying these basic household chores for you with its app that brings you someone to pick up your laundry and then drop it off back to you when it’s done. The valet generally picks up your laundry between 8 and 10 p.m. and returns it to you within three days or the next day if you select a rush delivery. You get premium quality cleaning and also save time by not having to do it yourself. Rinse is building the first and largest national (and global) brand in clothing care. It is addressing a massive consumer problem and creating a significantly better (and more standardized) dry cleaning and laundry experience through the combination of “smart scheduling” and best-in-class quality, all supported by a strong technology backbone that allows it to effectively manage the operational complexity that comes with scale. Therefore, it is an app that aspiring startup could look up to if they are thinking in lines of stepping a foot into this $40 billion laundry industry. Rinse generates an average revenue of approximately $1.5 million and has a throng of 30 employees. Deliveroo was among the many online food delivery apps that emerged after 2010 but sprinted to its success very fast. Launched in 2013 in the UK by Will Shu and Greg Orlowski, Deliveroo was awarded with the ‘Best Startup Founders’ award in the Europas Awards 2016. Deliveroo answers its customers’ hunger pangs by enabling them to order food from the restaurant outlets that do not have a set up of its own and charges a fee from the customer and the restaurant for the service. Users are charged as per their order whereas restaurants pay a commission. The quick delivery options and the coupon deals engage customers who wish to avail the best possible facility. The use of the app is high due to a higher number of customers, world class client benefit and higher restaurant choices throughout the world. This makes Deliveroo the most popularly downloaded for ordering app among users. Hence, this app could be looked for by startups. Whatever season it is, yard work always has to be done if you own a property. Plowz & Mowz offers the on-demand, contract-free seasonal services you need to spruce up your home property year-round. Their fleet of five-star contractors can take care of almost anything between your driveway and your door. Ordering is fast, easy, and efficient, so you’ll never have to haggle with a contractor again. Yard cleanup, mulch install/delivery and power washing are additional services you can get with the other customizable tasks you want done. Simply pay through the app and patiently wait for a plow or mower to arrive. Plowz and Mowz has grown considerably since their inception in 2013 and is one of the flag-bearing on demand home service apps in the US now. Following them could prove helpful for startups planning to enter this market. As the on-demand online delivery apps explored the food industry most out of other spheres, Uber came up with it’s own. It was launched in 2014 under the umbrella of Uber. This app enables users to read the menu, order, and pay for food from participating restaurants using their device, using an application on the iOS or Android platforms or through a web browser like most of its contemporaries. Users generally have the additional option of tipping for a delivery as well. The app detects the user’s location and displays restaurants open at the time separately from those that are closed. Payment is charged to a credit/debit card on file with Uber. Meals are delivered by couriers using cars, bikes, or on foot. The platform also occasionally features dishes from local celebrity chefs wishing to increase their public visibility, including some who do not have physical restaurants. Why UberEats when you create on demand app for food industry? Uber being the global stalwart that it is in the online cab service arena, thought of diversifying its business. This could serve as a plausible idea to apps already doing good. The founders could think in lines of expanding their business and explore other spheres like Uber. They could tag an almost similar service to their primary service and make it bigger. Uber Eats’ share grew from 3% to 24% in 2018. In the same year, the service was at a $6 billion bookings run rate, growing over 200 percent. It is now located in 250 cities with over 300 more locations needed to be equal to Uber. Massaging services are generally provided by masseuses or a massiers on prior summons all around the cosmos and so it was until the advent of massage delivery apps. Soothe sneaked into the market in August 2013 and has been there since then. Being in the market for 6 years now, Soothe is one of the prime ambassadors of massage delivery apps among many. It enables you to book appointments to get a massage in advance if you’ve got the app. You can book an appointment in as little as one hour in advance for a massage from a licensed five-star therapist any day of the week, delivered to you in the comfort of your own home. In July 2016, the company signed-up corporate clients like Facebook, Hulu, and Microsoft. According to the company, the move was partly motivated by a desire to smooth-out demand and mitigate the spike in service requests outside of the regular nine to five corporate business hours. By February 2017, the service was available in 51 cities in the US while also adding services to Toronto, Canada. In the summer of 2017, the company launched two locations in Australia by expanding its services to Sydney and Melbourne. On May 2, 2018, Soothe raised $31 million in Series C funding from The Riverside Company as well. Founded in 2013 by a bunch of Stanford students, DoorDash is an on-demand logistic startup. With its reach over 300+ cities, DoorDash has become a smashing success in food delivery business. The USP of DoorDash is its ‘Delight Score’ model. It is an amalgamation of different scores like food quality, delivery speed and popularity calculated into one score. The main advantage of DoorDash over its other competitors is the wide range of cuisines that they offer like Korean, European, Mexican, Italian, and Brazilian, besides the more famous ones. Doordash - one of the best? Though DoorDash is smaller compared to previous apps, it has a rightful place to be on the list of the best food delivery apps of 2018 & 2019. Therefore, it is definitely one of the apps to be looked for by startups in 2019 if you want to create an on demand app. The drivers are known as ‘Dashers’. As per a report in 2018, it said that the revenue comes from 20% commission fee charged from the merchants. The Dashers make more than $600 in one year. The on-demand delivery service apps mentioned above are already on top of the ladder in their respective services that they provide. But this write up mainly captures the areas of their growth and them acting as a soul of inspiration to startups intending to get into the market. Here, apps like Grubhub, Uber and Deliveroo have been addressed and elaborated upon just to help us throw some light onto how they built this vast empire. Ergo, this article not only chronicles their story right from the inception but also makes us aware of how dreams could turn into reality with a proper conceptualisation of the right idea. This blog aims to explain these models in depth, so that you have the better understanding of which path to take in your on demand journey. If you’re thinking of stepping a foot into the on-demand food industry, you could look up to Deliveroo, Grubhub or Doordash here. Or if you’re interested in developing something in lines of conveyance, you could look up to apps like Rapido. It’s all in here. You just need to get in touch with us. A click on your phone is all you need. We at logic Square Tech, will guide you through the whole process of selecting what’s best to start with and develop it for you. The only thing you need to do is trust us. We promise to make your experience in working with us worth remembering.